A few of you might remember when I shared my Outdoor Oasis and Outdoor Games Project back in July. 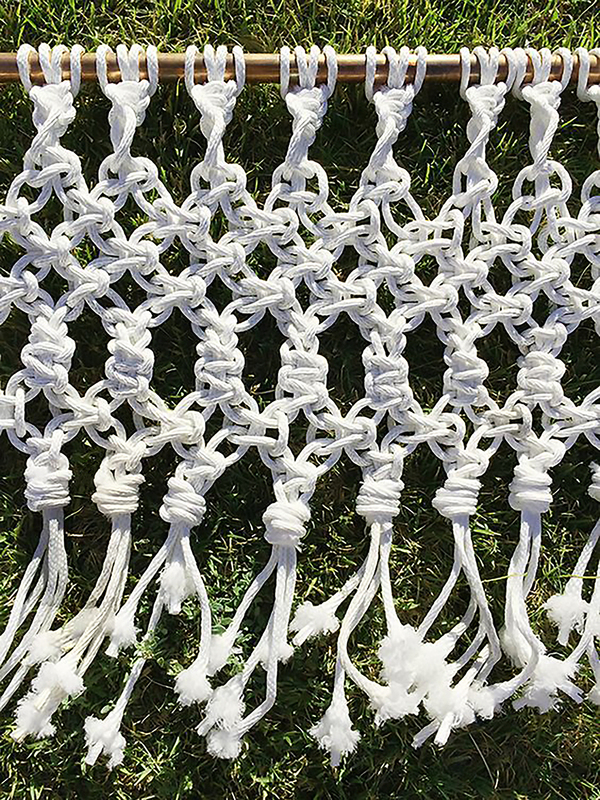 I thought I would share a bit more about the Making of the DIY Macrame Badminton Net – that was surprisingly easy to make – and instructions and images for how to tie each of the macrame knots I used in the project!. This is not our first rodeo, when it comes to macrame (see our DIY macrame hanging planter project), so it might be obvious at this point that we like a bit of the fringe over here at the House of TDC. This also happens to be one of the very first projects for the site that I worked on with Beth, my fab Gal Friday (you will be getting to know her a bit more now that we can come up for air from all of the projects going on), so let us just say she got a dose of the crazy that happens around here, right off the bat! Trial by Fire, eh? 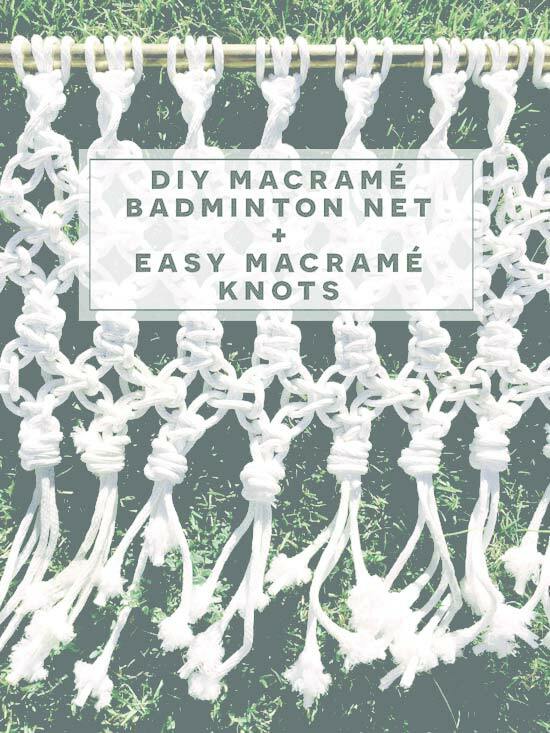 The full step by step for the DIY Macrame Badminton Net can also be found over on the Home Depot blog with detailed pictures and instructions for making your own masterpiece! 2 – 1 inch copper pipe at 5 feet in length. 1 – 1 inch copper pipe at 8 feet in length. 2 – 90 degree elbow pieces with 1 inch openings on either end. 4 – 200 foot bundles of clothesline or 800 feet of rope or paracord. STEP 1 // Cut your rope into 100 inch strands and fold each of them in half. You will secure the looped end to your long copper pipe using the larks head knot. You can see the steps for this in the image below. You will secure all of your rope lengths to your 8 foot pipe, except for 2 or 3 of them. Leave yourself a couple of these lengths of cord for use later when we tie off the ends of our project with a wrap knot. The Lark’s Head Knot is probably your most common tie-on knot. It is not precisely a knot, but still, it happens to be a great way to get your cord onto your pipe, rod, dowel, or ring. // The steps above are fairly straightforward and this baby involves nothing more than doubling up your rope by folding it in half, then folding that loop in your mid-section over your rod or ring by bringing it up from behind. // Once you fold it over you simply pull the loose ends up and through your loop. Easy Peasy, no? STEP 2 // Once all of your rope is secured with your larks head knots, you will pair them off in sets of two. Using the image and steps below, tie three left half-square knots using the four strands created by grouping your rope into pairs. When you make a chain of half square-knots all in the same direction, your rope will start to form a twist. Don’t worry this is what you want, it looks amazing! For those of you who like to work with your hands in some way, macrame is simply divine. Just so completely gratifying if you know what I mean. Plus you can pull up a folding table in front of the tv and watch The Knick or one of the meellions of Housewives franchises while you loop and tie your way to perfection! The square knot is another knot you will run across often throughout your macrame journey. You might need to tie a series of alternating square knots or even a half square knot, but it is very likely you will do something involving this fabulous basic at some point. Since a square knot is actually made up of two halves (duh, right? ), the image above shows you how to tie one of these possible halves or a left facing half square knot. To tie a right facing, you will simply do the opposite of these steps and work from the right outside cord, or cord 4, and tie the knot as you see in the next step. And since a half square knot is the first portion of a whole square knot, which I cover down below, you will need to complete these steps here before moving on to the next steps below. While the image above is fairly easy to follow, I will just skim over a few quick verbal instructions to help you understand what you are seeing. // You will need to separate out your lark’s head knots into groups of two so that each group has 4 cords for you to work with. // With one group of 4 cords, you will take the left outside cord – cord 1 and the black cord you see above – and bring it over the two cords in the center – cords 2 and 3 (white and yellow) – then under the cord on the right outside – cord 4 (beige). // Then bring the right outside cord – beige cord 4 – under the two center cords – cords 2 and 3 (white and yellow) – and up behind and under the curved edge of your first cord or cord 1 (black) – like you see in step 3 above. Once you bring it up behind like this, you will pull it up through your opening (made by cord 1) and out to the side. This will look like a pretzel and will be a bit like the first part of tying your shoe laces. When you pull this tight a bit, it should look like the last image. Now you can repeat this step with the same grouping of cords two more times to get that twisty bit you see at the top of the image above. STEP 3 // Now leave an inch and a half of your rope straight, then begin tying alternating square knots. You will tie five rows of these. A square knot is similar to our half knot in the previous step, in that it begins in precisely the same way. Begin by tying a single left half square knot, making sure to leave that inch and a half space. Once you tie a left half square knot just as you did in the last step, you will then follow it up with a right half square knot, as shown in the image above (mirrors the left half square – in reverse), and you will have completed one whole square knot. When continuing on from a left half square knot, simply work with the same 4 cords from their new positions (black cord 4 is now on the right and beige cord 1 is now on the left). // With your group of 4 cords, you will take the right outside cord – cord 4 and the black cord you see above – and bring it over the two cords in the center – cords 2 and 3 (white and yellow) – then under the cord on the left outside – cord 1 (beige). Do this for every group of cords all the way across your pipe. You will then have 1 square knot tied in each group of cords. Down below I will show you how to alternate them for your five rows of alternating square knots! Alternating Square Knots are a great way to create a net like pattern. The image for this shows the process from the beginning, but for the specific steps for tying a square knot, refer to the previous two steps. This image will give you an overview of how to alternate and create the pattern you see above. STEP 4 // With one whole row of square knots under our belt, we will begin on the second row (working toward 5 rows total). For row 2, you will skip the first 2 cords by pulling them off to the side. Then you will regroup your cords into new groups of 4 from there, going forward. Basically you will pair your 3rd and 4th cords together with your 5th and 6th cords (cords 7-10 will be your next group of 4) and you will tie a whole square knot (left half and right half square knot) with the new groups, all the way across your pipe until you run out of groups of 4. // For your third row you will go back to the groups as they were in your first row and include those first 2 cords once again! Continue on in this manner for 5 rows, alternating your groups and leaving out the first 2 cords for every other even numbered row. STEP 5 // You will now create a short sennit chain, but before we do this you will want to flip flop your cords in each group, to help alleviate the short cord syndrome, caused by tying square knots. To do this you will simply bring each of the outside cords in each group of 4, over the top of the middle cords, making them into the new middle cords for your groups going forward. 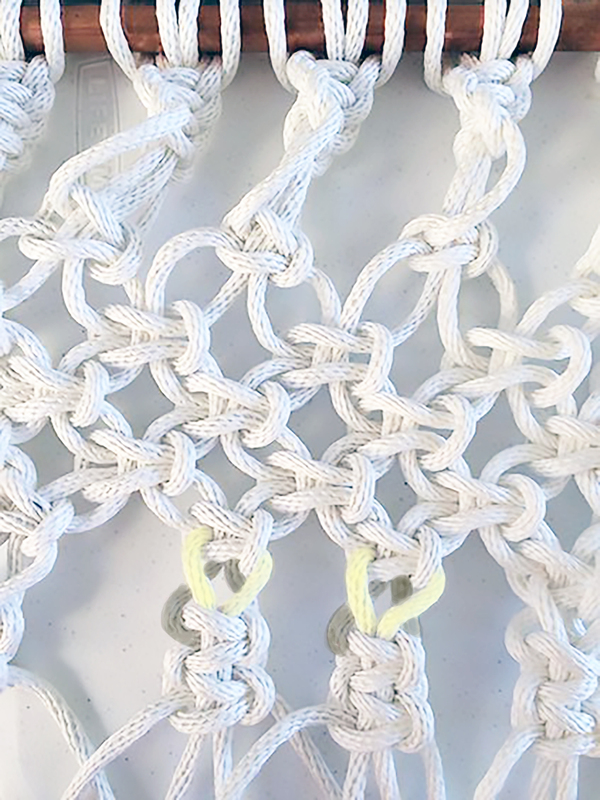 You can see the outside cords highlighted in yellow below and the inside cords in gray, as we begin knotting for this step (shown completed in the image below). With our newly swapped cords, we are going to create a short sennit (chain) by tying two square knots. Refer to the steps above for tying a square knot. For this, instead of alternating your groups after the first square knot, simply tie another square knot right after the first using the same four cords. STEP 6 // Once you have tied your 2 square knots, you will continue with alternating square knots once again. This time you will begin on the alternating row (row 2) or as if your second square knot from the previous step is actually the knot from your first row. You will create two rows of alternating square knots this time. You can see this in the image below, just after the sennit chain and above the bottom wrap knot. STEP 7 // You will finish your project by tying a wrap knot at the end of each group. This is where those extra cords come into play. You will want to use them to form the separate pieces that will wrap each group. The Wrap Knot or Gathering Knot is used to group your cords when you finish off a pattern and occasionally at the beginning or in the middle of a pattern like you see in my Macrame Hanging Planter. This was the trickiest knot for me somehow since the instructions I was working from left out a critical section, so I will try not to leave you hanging like that! To work this knot you will grab one of your extra lengths you set aside earlier. This piece can’t be connected to anything else like the separate cord you see in the first image step above (the white cord running underneath my group). This is your Working Cord. // Run your Working Cord under and alongside your group. // Create a slight loop by bringing your Working Cord around, down, then up and over your group. // Bring it down and back behind your group, making sure to leave your loop in place from the previous step as well as your loose end as you see in the image above (image steps 3 through 7). // Bring your Working Cord (now hanging down) back up in front of your group and over the top again, then around behind and down. Continue wrapping like this until your wrap is the size you want for your particular project. You will need to wrap at least 4 or 5 times, but shouldn’t need many more. // Take the end of your Working Cord and thread it through your loop. // Pull your loose end from the beginning of this knot in image steps 1 and 2 and pull it tight until your loop is pulled up into your wrap and is hidden. Now you can cut off any excess or tuck it away and into your wrap as well and secure with glue if you like. You can now leave your ends a bit frayed like I did, or dip them in melted wax to keep them tight. The easiest way to get your net put up is to put the pieces together laying flat on the ground. This will tell you the exact distance you need to place your legs so it doesn’t bow or splay. Then remove your 5-foot leg pieces and using a rubber mallet, gently pound them into the ground for several inches, making sure you don’t warp the top rim of your pipe. Then simply attach the elbow pieces to them and you are set for a fun filled afternoon of outdoor games. 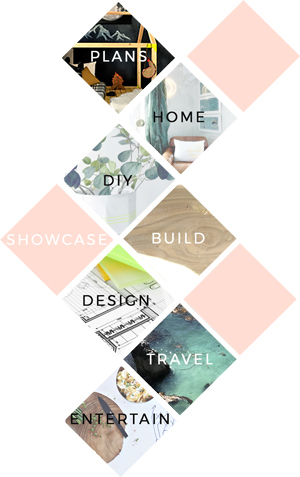 Next Next post: Reader Showcase // Francine Dining Chair!